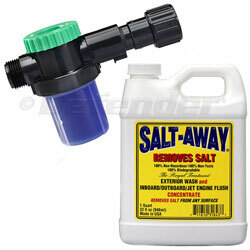 Salt-Away is the perfect preventive maintenance product. It allows you to easily and quickly dissolve salt crystals and wash them off your boat, sails, hardware, car, motor home and any other piece of equipment prone to the corrosive effects of salt. Water alone doesn't dissolve salt, but Salt-Away will. This kit comes with one quart of concentrate and a mixing valve with 6-ounce reservoir. The valve automatically dilutes the concentrate to the right mix so you're not guessing or wasting product. One 6 ounce reservoir will flush one engine and wash off a boat and trailer up to approximately 38 feet (11.58 meters) in length. In addition to dissolving salt crystals, Salt-Away leaves a protective film to ward off future exposure to salt. It can be used on fiberglass, paint, rubber, plastic, Eisenglass, sail covers, chrome, metals, glass, concrete and brick without damaging the surface. This easy-to-use salt remover is water-based, non-hazardous and 100% biodegradable.